Sharing Economy: End Of Ownership? 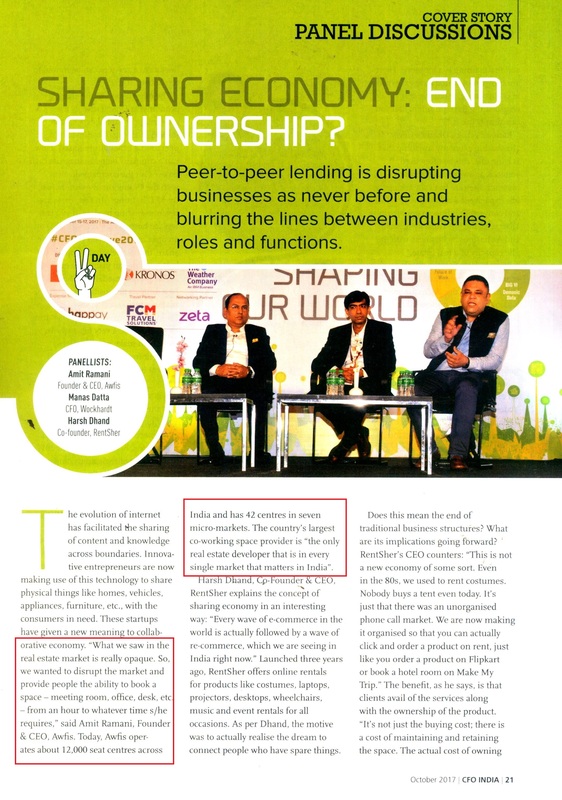 The following article is based on a panel discussion during the annual CFO Conclave held between 15 and 17 September. The panellists were Manas Datta, CFO, Wockhardt; Harsh Dhand, Co-founder, RentSher; and Amit Ramani, Founder & CEO, Awfis. The evolution of internet has facilitated the sharing of content and knowledge across boundaries. Innova­tive entrepreneurs are now making use of this technology to share physical things like homes, vehicles, appliances, furniture, etc., with the consumers in need. These startups have given a new meaning to collab­orative economy. “What we saw in the real estate market is really opaque. So, we wanted to disrupt the market and provide people the ability to book a space – meeting room, office, desk, etc. – from an hour to whatever time s/he requires,” said Amit Ramani, Founder & CEO, Awfis. Today, Awfis oper­ates about 12,000 seat centres across India and has 42 centres in seven micro-markets. The country’s largest co-working space provider is “the only real estate developer that is in every single market that matters in India”. Harsh Dhand, Co-Founder & CEO, RentSher explains the concept of sharing economy in an interesting way: “Every wave of e-commerce in the world is actually followed by a wave of re-commerce, which we are seeing in India right now.” Launched three years ago, RentSher offers online rentals for products like costumes, laptops, projectors, desktops, wheelchairs, music and event rentals for all occasions. As per Dhand, the motive was to actually realise the dream to connect people who have spare things. Datta explains that earlier there was outsourcing of the capacity, but “the new technology is forcing us to look at the delivery model and not only capacity building. It’s also about delivering at the right time”. The shared economy will help grow the overall economy in a sustainable way and also support millions of people in a sustainable way, Dhand said. The hospital capacity in India and the US is overflowing. Sometimes patients, who are discharged early, need the fowler cots or the wheelchair at their house till full recovery. “He doesn’t want to buy a fowler’s bed or a wheelchair and rents these things, which can then be used by another patient who is discharged. So, that’s how even with a more complicated system like healthcare, we can actually introduce the sharing economy,” he said, adding, “When I was in Phillips, we used to sell out ECG machines. Now I work with Phillips to get those machines out in the market for camps on a sharing basis.” He suggested that a lot of spare things that are in hospitals or services can be moved to the house for use. The other aspect of the sharing economy, as Dhand says, is the conversion of capital expenditure (capex) of an organisation to operational expenditure (opex). How can a company better manage its cash flows? Can the company do away with the `5 million investment just for LED lighting? “In fact, there are revenue sharing models. If you can replace normal lighting with LED on an opex model and you can revenue share, that model can be applied for better expansion plans,” he explains.